A server computer is a host that is running with controller which share their resources with client computer. Here we will go through the settings for client computer. Step 1. Click right button of the mouse on two folder: C:\program files\701Server and C:\program files\701Client and select “Sharing and Security…” to open 701Server Properties window and 701Client Properties window. Step 2.Select “Share this folder on the network”. Step 3. Select “Allow network users to change my files”. Step 6. 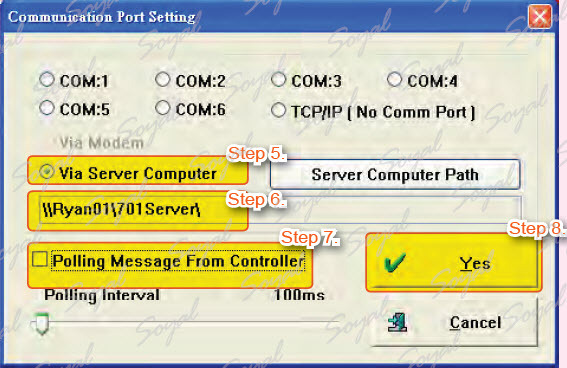 Choose server PC path. Step 7. Don’t select Polling Message From Controller. Copyright © 2014 · All Rights Reserved · ICT Smart Co., Ltd.